By now I have convinced everyone here that I brought the beautiful Spring weather with me. Holland at it’s best. The twenty minute bike ride to the railroad station from my cousin’s home goes through the countryside with 18th century mansions, along the Canal that Hans Brinkers must have skated on, with his Silver Skates, to Haarlem, and bulb fields. I took the train to Leyden. The city has the oldest university in the Netherlands, inaugerated in 1575, at the end of the 80 year war with Spain. It was initially financed by the proceeds of the Catholic Church treasures confiscated by the Protestants under the first Dutch Governor Prince William of Orange. Last year when I did my searching in the National Archives, for more leads on the circumstances of my mother’s roll in the 2nd WW resistance, I met Sylvia Braat. We exchanged the surprises we both had found that day in the Archives. We became friends. Sylvia also discovered in her town, Oegstgeest, records, details on my mothers cousins who had lived here a good part of their life. This in turn led me to more discoveries and contacts of my generation to fill in many of the gaps on the story I am writing of my mother’s life. Sylvia picked me up at the Leiden station and showed me the houses where my relatives had lived. I have a vague memory of visiting my mother’s cousin when I was a child. Sylvia published her mother’s war time diary, written by her into a book form. Somewhat similar to my project. Titled: “Een Perzisch kleed voor een kistje aardappels” (A Persian rug for a crate of potatoes), Published by De Vereniging Oud Oegstgeest. These things happened during the war. I still vividly remember watching farmer Dekens in Middenmeer, where my twin brother and I had taken refuge during the so called “hunger winter” of 1944/45, trading two measures of about a pint each of wheat, for a brand new leather horse saddle, bit and bridle. The cover is illustrated by a portrait of Sylvia’s mother painted by Eddy Wijnans in 1942. Now, talk about a small world. Eddy is the father of a long time friend, Arthur Wijnans, who was raised across the street from my aunt and whose parents were friends of Sylvia’s parents. 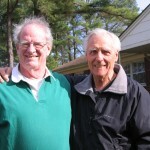 I met Arthur for the very first time in 1973 at the Gig Harbor, Wa. airport. We had a long buisness relationship and have stayed friends and have sailed on each others boats through the years. I had dinner with Arthur and Marjan last Wednesday. Sylvia gave me some good suggestions on completing and publishing my story. 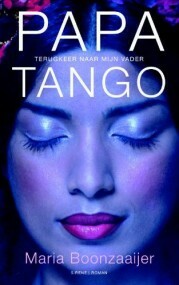 Thursday I go to Utrecht and Culemborg. It is another gorgeous bright crisp Spring day. We needed gloves on the bike ride to Haarlem this morning. Holland went to Summertime last night, so it was early. The service at the Cathedral was a real treat for me. 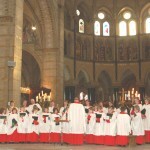 Every other Sunday the Cathedral Boys Choir accompanies the Sunday 10 o’clock mass. Pure, crystal clear voices. There are a few older men who were at one time members of the boys choir. Two 10/12 year olds sang a duet, without amplification and you could hear them loud and clear in the back of the cathedral. Superb accoustics. Listen to them 03 Nummer 3 . 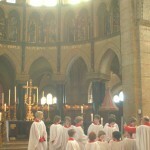 They sang Ave Verum Corpus from Edwar Elgar, during the offertory. Unforgettable. But it as a I have written before, the congregation barely outnumbered the choir with an average age above 65. Last week’s collection was below 500 Euroes… In many countries I have visited full churches and much lower age averages who would kill for the maginificent churches and the liturgical accompaniment here. The over hundred Saint Matthew passion performances this Easter season in Holland are sold out at ticket prices from $50 to $75. The Dutch worship the music and architecture inspired through the Faith of their forefathers but feel no need to worship the same God who inspired the architects and Bachs and Haendels. The Boonzaaijers were my hosts for most of the weekend. I last saw them in the anchorage in front of the “Jimmy Buffet” cafe on Huaini in French Polynesia, in 2005. Maria grew up in the same neighborhood, Rivierenbuurt, as I did, in Amsterdam. A couple with many talents and well travelled. 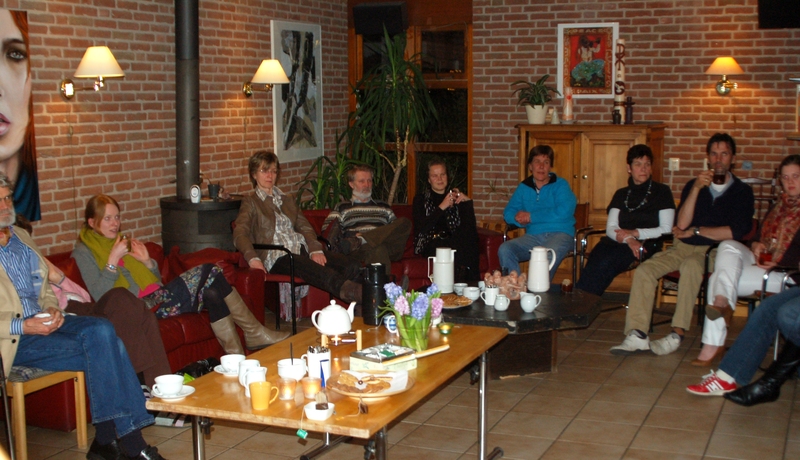 Stephan is a Protestant pastor and the leader of a community in Barneveld where several families and individuals live together and share meals, discussions and devotianals in their community center “de Bondgenoot” www.bondgenoot.nl. It is a story about a classical soprano searching for her Argentinian father and younger sister in Argentinia. I shared some of my life’s experiences with the community in their Friday evening meeting and I felt very blessed by their response and sense of community with each other. Sunday morning I will bicycle with Riet, my cousin’s wife, to the mass at the basilica in Haarlem, Sint Bavo. There will be pictures, I promise and most likely of bulb field we’ll be passing on our way, I promise. 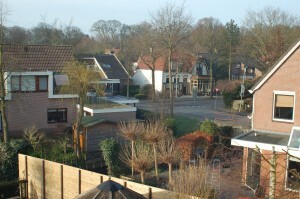 I moved in with my cousin Gido van Ommen and his wife Riet, in Heemstede, near Haarlem. 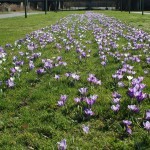 Very close to the Keukenhof in the Dutch bulb growing area. The below picture is my view of a typical piece of Holland from my penthouse room. I’ll be working here on adding the new facts I have gathered on the book I am writing. Last Tuesday I spent 9 hours in the National Archives in The Hague to supplement the war time experiences in the story and the next morning I uncovered more background on the life of my mother’s Nazi cousin in the Hilversum archives. The weather has been superb, cold clear nights, bright warm sunny during the day. The bare trees in this picture will be green on the next blog. This afternoon I take the train to Barneveld to meet with Stephen and Maria Boonzaaijer of “Yo Soy” who I last saw in French Polynesia in 2005. On Fat Tuesday Carl McKenzie and his lady friend Karin came up from Baltimore to see me in Chesapeake, Va.
For those of you who were following the “Lisa” mails from South Africa into the Chesapeake Bay in 2007, this story may ring familiar. It was a nearly windless day,the ocean was like a mill pond. June 13, 2007. I was on my way from Trinidad to Norfolk, Va. 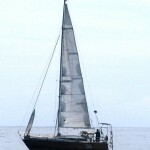 It was at 31.27 N 73.40 W. For the very first time since I left in March 2005 I see a sail boat in the middle of the ocean. It turned out to be “Morning Star” on their way from Jacksonville, Fl. to Bermuda. 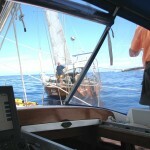 We talked on the VHF radio and decided to come along side. Carl and his wife were on their way to the Med with a Swiss couple from Geneva. They brought gifts. “Lindt” chocolates!! We exchanged a bottle of Trinidian rum and e-mail addresses. Carl took the below pictures. Carl and Karin are planning to head into the Caribbean this winter and there is a good chance that we will meet up again, 4 years after this happenstance rendez vous. 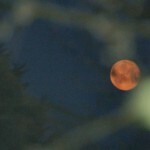 Sorry, I can’t help my self from putting another moon shot on the blog. This time I managed to hang on to them. 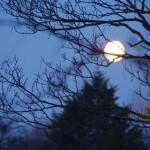 Just took it at moon set this Monday morning. 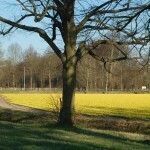 Spring got a beautiful start here in Holland with bright sunny days but cold nights. Yesterday I drove to Bergen and Haarlem, the edge of the bulb growing area. The crocusses are in full bloom. In a week or two the Tulips will have their turn. The full moon just came up and for once the sky is clear in Holland. Because the moon is about as close as it gets to the earth this month, one can clearly see the elevations on it’s surface. But I could not capture this on camera. So, you’ll have to take my word for it. And then I lost the pictures all together. You all get a break of this month’s full moon picture. 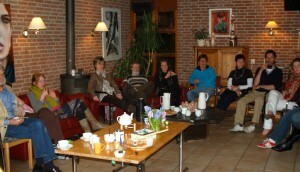 Last Wednesday we celebrated, Herman, my brother in law’s birthday and Dirk Jan, my nephew’s, birthday as well. This afternoon I bicycled to the yachtclub “de Schinkel” where I was the guest with Fleetwood, till last summer. It was a beautiful sunny afternoon and we sat outside and caught up on our adventures. 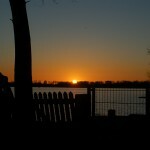 On the way back along the “Nieuwe Meer” (New Lake) I caught the below sunset. 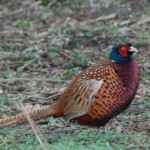 And the picture of the Chinese Ring Neck Pheasant. Yesterday, I went downtown Amsterdam to visit the NIOD (National Institue for War Documentation) to gather some more facts for the “Mastmakers Daughters”. This Tuesday I’ll be visiting the National Archives in the Hague once again. I obtained tickets to the Saint Matthew Passion in the Amsterdam Concertgebouw for April the 13th. This is one of the first times that I am in Holland at Easter time. It will be an emotional experience with many memories. I am starting to put my schedule together for a busy round of visits with friends and newly discovered relatives. Except for the Metro breaking down in the China Town station in Washington D.C. and having to walk up and down the elevators with my huge backpack and two smaller backpacks to the Metrotown station, I had a good trip. Jeannine drove me to Richmond, Va. to the Amtrak connection to Washington D.C. My favorite travel agent managed to get me in Business class again. Great service and I was able to stretch out but did not sleep much. I arrived at 6 a.m. at Schiphol. Spring has sprung here as well. This last weekend in Chesapeake we had over 75 degrees (25 Centigrade). As soon as I catch up on my jet lag and sleep deprivation I shall put a schedule together and make appointments with the newly discovered relatives and old friends here. And use the material here to complete the book I have been working on these last 4 months in Virginia. Besides Mardi Gras it is Day of the woman and Joke (Pronounced Yokah) Brancart’s birthday. And I have company today of Carl McHenry. He and his lady friend drove down from Baltimore. We met in the middle of the Atlantic in June 2007. 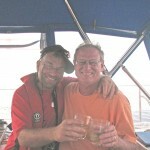 Carl was on his way from Jacksonville, via Bermuda to the Med. I was on my last stretch home from Trinidad to the Chesapeake. There was very littlewind and Carl and his crew had a surprise for me. Lindt chocolates. I cannot find the pictures I took of our mid ocean exchange of gifts. “Morning Star” was the very first yacht I had ever seen out of sight of land since I commenced my circumnavigation in 2005. 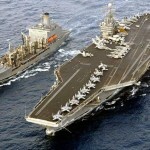 Since then I have seen two more on my crossing of the Atlantic in 2009. In Vietnam the International day of the Woman is a a serious celebration. It approaches our Valentines day. I started a new Feature on this web site under Number 98) on the index TRADITIONAL SAILING VESSELS. Go take a look. In particular the article I wrote on Basket Boats should be of interest to you. Little has been published in English on these unusual Vietnamese woven boats. I had intended this for a newspaper article but in this way I hope to increase the traffic to the site so that I increase the audience for advertising my upcoming book. Sunday March 6. My last week in the U.S.A. Thanks everyone for your birthday wishes! My four month visit in Virginia at the McDonnells is coming to an end. I’ll be leaving here Monday morning the 14th and arrive Tuesday morning in Amsterdam. Since my first call here on “Fleetwood” in June 2007 I have spent a number of visits here besides the hospitality of the McDonnells I have made a number of good friends here. I like the area and the climate. I’ve done all I can do on writing the book about the life of my mother and will be adding material that is waiting for me in Holland. It has grown to about 250 book pages. The plan had been with me for the last 15 years but I was not certain when I started writing here, last November, that I ‘d have enough to make a book. But the material just kept growing from everywhere. It is an amazing story of a very ordinary woman who left an amazing legacy and happened to have lived in a century that saw so many advances, falls, upheavals, wars and triumphs. This was the ideal spot to concentrate and write undisturbed. There is still much work to do. But keep checking in for the progress. 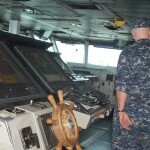 This afternoon Sean showed us around the aircraft carrier “Harry S. Truman” on which he is stationed. She is getting ready to go in dry dock. 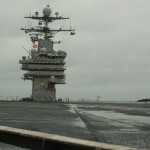 1091 feet longs carries about 6,000 crew when fully armed. 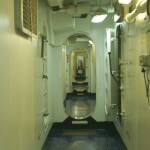 This hallway runs underneath the flight deck the 1091 feet of the carrier, you’d better be sober finding your bunk on this monster.